Thanks very much for all your interest in the competition we are running for a free Pi-Car – and of course to Raspberry Pi for featuring us in their Sunday Grab Bag so you could all find us. 5) You like cats more than dogs – cats feature in a surprising number of ideas, dogs in only one or two! 6) Guten Tag! – Lots of you are German! 7) You have some really great ideas on what you would do and it is going to be really hard to pick 5 winners – but for those who don’t win we’ll have some news soon on how to get hold of a Pi-Car and how to make it work. 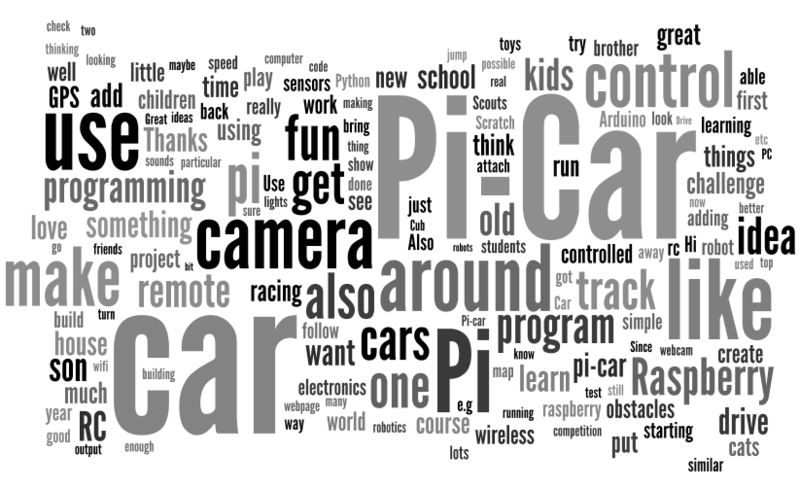 Putting a GPS on the Pi-Car is a great idea. wish i had thought of that.